There is a passage in Psalm 142:4 that was brought to light in my soul early one morning in the emergency room in Warner Brown Hospital. I was the surgeon on call to the ER this particular night and was soundly sleeping until the telephone rang at our home at 3 AM. These were the days prior to ER physicians who are hired to stay on-site and treat most every emergency including lacerations. My responsibilities as the surgeon on-call were to treat every surgical emergency from simple lacerations to major traumatic wounds. The ER nurse informed me that she had just admitted a patient who had been drinking alcohol in a local bar; had gotten into an argument and sustained multiple facial lacerations that needed repair. I knew this was going to take about 2 hours, so my sleep for the night was essentially over. While driving to the hospital, I had a major struggle in my heart with a wicked attitude toward this person whom I did not know. My thinking was something like this; “Why in the world would a person be drinking whiskey in a bar at this hour and then have the ignorance to get into a fight? 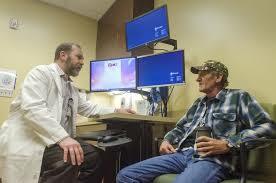 He doesn’t have the slightest concern that the doctor, who has to come and sew him up, has major surgical cases scheduled at 7 AM and needs his rest!” By the time I got to the ER, I had worked myself into a state of anger toward this man whom I had never met. I half-heartedly introduced myself to Tony, a 60 year old man who was unshaven with a 3 day-old beard. He reeked of whiskey or cheap wine, and was barely coherent in speech. I discovered he was unemployed and had no insurance to cover the large hospital charges he would incur, and certainly was unable to pay my much smaller fee for such a service. So here I was in the early morning hours, stuck in the emergency room, with no prospect of further rest and no possibility of any financial reimbursement. The more I thought about it, the less I liked Tony and the more resentful I was of him and people like him. I would describe my attitude as civil, but certainly not kind nor compassionate. I sutured his multiple lacerations as quickly as I could, without taking much time with the cosmetics, and engaging him in as little conversation as possible. If Tony had gauged my Christian witness to him on a scale of 1 to 10; with 10 being the highest, I am certain I would have received a 1. In his present state; however, he wasn’t able to guage much of anything. When I finished and Tony was bandaged and ready to be released, I went into the small adjacent staff room where there was coffee available, and a quiet place to write on the medical record. A good friend and medical colleague was there also. He had been treating a young patient with a severe nose bleed and had finally gotten the bleeding stopped. He asked me why I was there, to which I responded as I was sipping the hot coffee, “I’ve been sewing up a character named Tony that is so drunk, he can hardly speak. I don’t know why we have to keep treating such sorry excuses of humanity like him, and especially in the middle of the night!” I seemed to have felt better by getting all of that out. My friend listened quietly to my tirade, and then softly said, “Isn’t it a wonderful thing, that our Savior died for characters like Tony, just like He died for us.” I suddenly didn’t feel so well, and was ashamed that my flesh had so ruled my thoughts, my words and my actions that I failed to see just how much value that the Lord Jesus had placed on Tony, and what little value I had placed on him. Psalm 142:4 is a cry from David, at a time when he was hiding in a cave, and could not tell that anyone cared for his safety or his soul. The world is full of desperate people who have lost hope that there is anyone who has the slightest concern for them, whether they live or die. My experience with Tony in the emergency room that night, combined with the gentle rebuke from my Christian colleague, changed my heart. I saw my role as a Christian physician more clearly. God called me to serve others with gladness; to consider every appointment as divine, and to value everyone’s soul as much as He does. Thank you Tony for allowing me the privilege to serve you. God loves you and so do I. Love your stories Uncle John. I’ve been reading them since day one. They are an inspiration to me. It’s exciting to open up your Blog and find a new story just about every day. I hope you don’t mind but the first Sunday your Blog was on the web, I told my Sunday School Class about it. They all seemed excited. Keep those wonderful stories comming. Your doing a great job!!!! Thank you Andy. It means a lot to me to have your encouragement in recording all these experiences. I know that your sisters are reading them also and that blesses me. How I miss your Dad, and wish I could ask him to tell me just a few more stories, so I could write them down! Blessings to you and Ginger. He had an unusual sense of humor, Huh? I tell that story to alot of people. After he would give me a shot he would always leave the needle in for me to pull out. This continued until I was an adult. He always liked to tell the story about how he hypnotized you when you were young boy. There are always two sides to a story. I would love to hear your side if you can remember it. I feel like I keep saying the same thing over and over again…but here it goes: I just LOVE this story! Keep on writin’ ’em!! Well, you have officially ruined all the plans I had today with work that needs to be done. I can’t do anything but read these wonderful stories! Really enjoying them.